Sometimes, when we are too close to something, we fail to see its beauty. This is probably the reason why there are still many Boholanos, especially those living at the coastal areas, who have yet to visit the viewing deck of the Chocolate Hills in Carmen, Bohol, or even the new one in Sagbayan, Bohol. Because we know it is just nearby, we sort of miss out on how extraordinary the thing is. It is exactly the same with the Church of Our Lady of the Immaculate Conception in Baclayon, Bohol, the second oldest stone Church in the Philippines. I don't think many really appreciate its place in the history of our country. Baclayon is a municipality which is 6 kilometers east of Tagbilaran City. It is Bohol's oldest municipality and the mother of 3 other municipalities, namely, Alburquerqe, Balilihan and Sikatuna. In Cebuano, "baclayon" means the distance that one needs to walk. This is probably the reason why the town was so named as it is located at the coast of Bohol several kilometers away from the other communities of inhabitants of the island at that time. In 1595, or some 413 years ago, the first Spanish missionaries in the region, known then as "doctrineros", arrived and settled in the area. The priests, Fr. Juan de Torres and Fr. Gabriel Sanchez, erected a visita immediately after their arrival. Baclayon became the first seat of the Spanish Jesuit missionaries in the Philippine islands. However, fear of Moro marauders soon forced the Jesuits to move their headquarters inland to what is now the town of Loboc. It was only in 1717 that Baclayon became a parish and construction of the stone church as it stands now commenced. This makes the Baclayon Church the second oldest stone church in the Philippines. The oldest is the San Agustin Church located in Real Street, Intramuros, Manila, whose foundation is said to have been laid in 1571. Some 200 natives were forced to work and construct the church using coral stones which they took from the nearby sea, cut into square blocks, and piled on top of each other. The forced laborers used bamboo to move and lift the stones in position and the white of probably more than a million eggs to stick the stones together, a testament to the early quality workmanship of Boholanos. The stone church built by the Jesuit was completed in 1727. A large bell was installed in 1835. 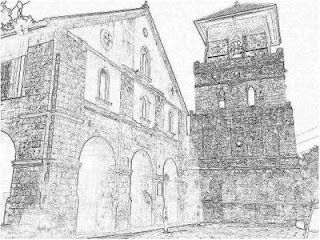 In the 19th century, the Augustinian Recollects added a modern facade and a number of stone buildings which now surrounds the church. All these have largely been preserved even to this day making the church one of the best preserved stone churches in the country. Somewhere underneath the Baclayon Church is a dungeon where natives who violated the rules of the Spaniards and of the Roman Catholic church were punished. Next to the church is the old convent which now houses a museum containing religious relics, artifacts and other antiquities dating back to the 16th century. Among the museum's collections which you can view for a few pesos are an ivory stature of the crucified Christ looking towards the heaven, a statue of the Blessed Virgin Mary said to have been presented by Queen Catherine of Aragon, relics of St. Ignatius of Loyola, old embroidered eccelessiastical vestments, books with carabao skin covers, librettos of church music written in Latin on sheep skins and cuadro paintings made by the Filipino painter Liberato Gatchalian in 1859. One writeup also mentions an image of St. Blaise, patron for the throat, which is said to have been stolen and returned to the museum, courtesy of a buyer, only 2 years after. The same writeup mentions an image of the Holy Family which is said to have been hit by cannon ball but survived without a scratch. Other writeups mentions a crystal chandelier, a silver tabernacle, an altar inlaid with gold, life-size statues, some elegant cups and crowns, among many others. I have been to the Baclayon Church many times, but as is obvious in this post, I have never been there long enough to see and appreciate all its wonderful and historical details. Still, I am very proud invite everyone to visit it and learn more about our history and our Catholic faith. For I believe knowing more about the church is really a pilgrimage. It will, I hope, bring us closer to our Creator and the real purpose of our lives. Many thanks for this, 'bay Gibo. This church is very important to me as it is my hometown's church. I have spent many wonderful childhood memories in this church e.g. regular Mass, Holy Week, etc. And, my wife and I were married in this church a few years ago.